One of the challenges in using T-shirt transfer film (aka, t shirt vinyl) for garment decoration is learning to adapt to different films. Not all heat transfer films are the same. Many garment decorators want to use the same plotter settings and processes for all their custom Tees. That’s a little like using the same recipe whether you’re cooking chili or lasagna. Our new EnduraTex Flex T Shirt Vinyl is a film of a different flavor. It serves up very soft and durable graphic Tees and custom apparel; but you may have to change your recipe just a little to get the flavor just right. Like any good recipe, the secret is in the ingredients. One of the ingredients that differentiates EnduraTEX Flex from our other offerings is the liner. It works a little differently than Easy Weed or Easy Weeding Sport. So is the new EnduraTex Flex better or worse? Like, food, it’s partly a matter of preference. Here’s how to choose what’s right for you. Some of our more popular heat transfer films are Siser Easy Weed and Chemica Easy Weeding Sport. Because these products are much thicker, they have a self-adhesive carrier with a fairly high tack level. This is because they require more force to cut, and the high tack liner hold the product down while the blade is cutting it. The high tack means that, in practice, they’re not actually “easy to weed”. It requires more pull strength to weed your cut graphics because the liner is holding the film quite firmly. It’s also tacky to the touch. They do have other wonderful features, but this really isn’t one of them. So why do people use a film that requires more muscle? Repositionable: The main benefit of using a film with a tackier self-adhesive carrier is easier repositionability. In other words, you can place the graphics on a garment and, if you need to move them around, you can stick and re-stick them on the shirt until you get that Goldilocks moment. The letters will stay put because of the tack level of the liner. 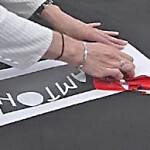 Heat transfer films with low tack liners don’t work as well for repeated repositioning on the garment. Hot peel: These films also have a hot peel release. After the press cycle is complete, you can remove the liner almost immediately. This means you can proceed to the next layer or next garment without delay. The hot peel feature supports quicker production time for layered garments and high volume orders. Thicker: Due to properties of the liner and face stock, these films are not quite as soft as a traditional PU T-shirt transfer film. Other products like EnduraTex HotMark 70 or EnduraTex Flex tend to have a softer hand when applied to fabric. Easier weeding: As noted above, the “Easy Weed” and Easy Weeding Sport” are not really. Easy to weed that is. Products like EnduraTex HotMark 70, Flex, and Fashion have a carrier with a heat-activated adhesive. As you weed your cut graphics, there is little or no resistance from the release liner. Just pull off and put it on the garment. Since weeding cut graphics can be one of the most time consuming aspects of creating T shirt transfers, it’s nice to have a film that doesn’t work against you at this stage. Soft and Flexible: EnduraTex Flex and HotMark 70 have a softer ‘hand’ than hot peel, high tack films. They tend to feel more like part of the fabric, which is what most garment decoration customers want. EnduraTex FLEX has the added advantage of being universally applicable with a wide range of acceptable temperatures suitable for everything from nylon to cotton. Not as repositionable: The downside of these films is that, because their adhesive is heat-activated, the film slides across the shirt easily when placed on the garment. This makes it easy to slide into place, but it also means it won’t necessarily stay put if you jostle or move the garment before pressing. So at this stage, these soft PU films requires a little more careful placement. Cold peel: And, as noted above, EnduraTex Flex, HotMark 70, and Fashion are not hot peel films. They must be allowed to cool to room temperature before the liner can be peeled off. If you’re creating a layered garment, apply each layer separately, peel the liner, let it cool, then proceed. So there are advantages and disadvantages, pros and cons, to either type of film. Choose the best film for your needs, or use different kinds for different kinds of garments. SignWarehouse stocks an enormous variety of heat transfer films to suit all kinds of tastes. But they don’t all work the same way. Some may require you to adjust your recipe a little.